So, I recently shared on my facebook page that I have a new blog sponsor and that I was going to have a fun giveaway to celebrate. Well, Fashionable Fabrics has graciously offered a $35 gift certificate to one lucky winner!! 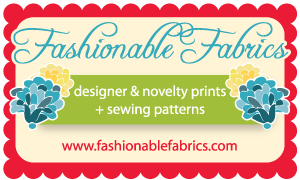 Fashionable Fabrics is an online fabric store filled with the latest fabrics, trims and notions. They also have a wide selection of novelty fabric. I just purchased some super cute fabric from this section the other day, so I can tell you first hand how huge the selection is. Their fabric by theme section is easy to navigate and locate your favorites quickly. Not looking to buy a whole yard? Then the remnant section is the perfect place for you. Looking for a great deal? Well, their sale selection is updated on a regular basis, so check it out. I do, almost daily. They have affordable prices and ship not only in the U.S, but internationally as well. And right now they are offering a flat rate shipping price of $4.95 or less (open to U.S. orders for a limited time). That's 8 ways to enter....Please leave a comment for each entry (and make sure there is a way for me to contact you if you win). Contest will run until Monday, August 20 at midnight est. Winner will be chosen via random number generator and will have 24 hours upon notification to respond. I will announce the winner on my facebook page. This giveaway is now closed, thank you to all who entered. I follow Fashionable Fabrics on Facebook, (thats a lot of f's in a row!) thank you for the giveaway! 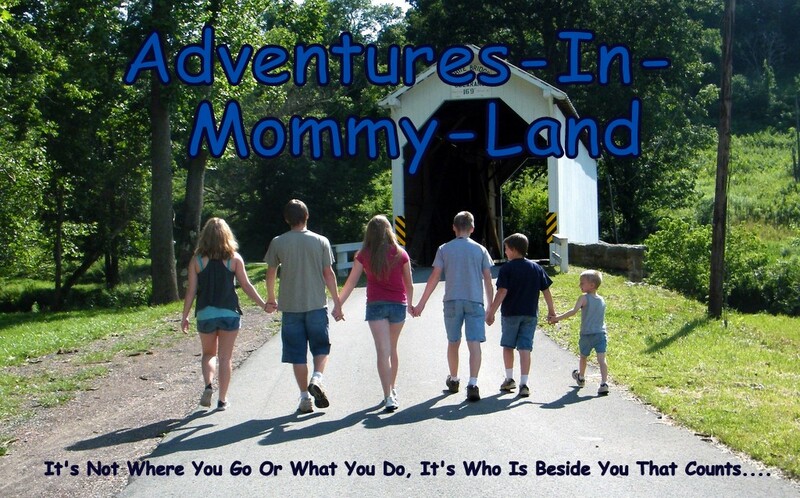 I follow Adventures-In-Mommy-Land on Facebook too! Lastly, I follow Fashionable Fabrics on twitter. Thank you again! Following your blog via Google Friend Connect. I follow adventures in Mommy land on FB. I'm following Fashionable Fabrics on Pinterest too! I like Fashionable Fabrics on FB as Wendy R.
Following @FashionFabrics on twitter as @ArtsyChaos. I like Adventures-In-Mommy-Land on FB as Wendy R.
Following @jfamilyofeight on twitter as @ArtsyChaos. I liked Fashionable Fabrics on Facebook. I'm following Fashionable Fabrics on Facebook. maloydeals at gmail dot com. I like Fashionable Fabrics (on facebook also) !!! Following fashionable fabrics on pint rest . Following adventures in mommy land on FB. I like Fashionable Fabrics on FB! I follow Fashionable Fabrics on Pinterest. I like Adventures-in-Mommy-land on FB! I already Like Fashionable Fabrics on facebook. I follow Fashionable Fabrics on pinterest! I like FF on FB. I follow FF on Twitter. I tweeted the giveaway, also. I also follow Fashionable fabrics on Pinterest. Super fun, btw. Liked Fashionable Fabrics on Facebook. Followed Fashionable Fabrics on twitter. Followed Fashionable Fabrics on pinterest. Liked Adventures In Mommy Land on facebook. Followed Adventures In Mommy Land on twitter. 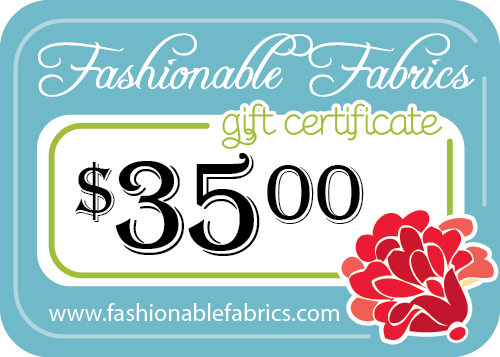 I'm following Fashionable Fabrics on Facebook! Thanks for the giveaway! I'm following Fashionable Fabrics on Twitter. Thanks for the giveaway! I'm following Fashionable Fabrics on Pinterest. Thanks for the giveaway!